Preschool Playbook: Sing, Sing a Song. 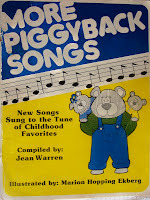 Three books I use very often at school are called PIGGYBACK SONG BOOKS. I LOVE these books. We have three versions of the book at our school; Piggyback Songs(red, 1983), More Piggyback Songs(blue 1984), and Piggyback Songs for School(black, 1991). I will tell you my two favorite ones are the red and blue version. These books were already at the nursery school when I began and they were quickly added to my everyday repertoire. One even has the cover off I use it so much. The songs are fun, the children pick them up easily, and they are easy to learn. The books are published by Totline Press, Warren Publishing House, Everett, WA 98203. I found them on Amazon.com too if you are interested. Thanks for letting me share a favorite. Sing often, it's always great to have a song in your heart!